Cotic first launched the Roadrat a couple of years back as a flat bar'd bike and pretty much ever since they've been threatening a drop bar version, so now here it is. Drop bars or not the Roadrat's sloping top tube and compact geometry shows its mountain bike heritage, it comes from the same stable as the splendid Soul, and gives you a lot of goolie clearance (stand over height) which is great if you have a track standing 'moment' at traffic lights or junctions. Built using fairly thin diameter double butted cro-moly tubing the Roadrat's frame is both light yet durable. Building an urban crusader in steel prevents dinks caused by general town life i.e. people carelessly pranging your bike with their bike lock or pedals etc – don't get me started. It's a good looking bike too, attracting a lot of admirers when exercised around town, the graphics are very understated and the skinny tubes make it look sharp and business like. The Roadrat has all the characteristics that a good steel frame should; the springy nature of the material makes it feel lively and responsive and mated to the Road Hog, a robust looking straight legged steel fork, has excellent tracking without being too twitchy. 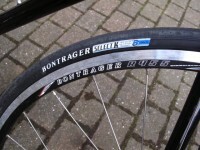 Our test bike came with £90 worth of Bontrager carbon uprades: Race X lite drop bar and seat post. For the added comfort that these components offer I'd say that's £90 well spent. The combination of those carbon bits with the springy steel frame and 25c tyres make this bike noticeably comfortable even on short rides, allowing you to stay in the saddle and get on with it. 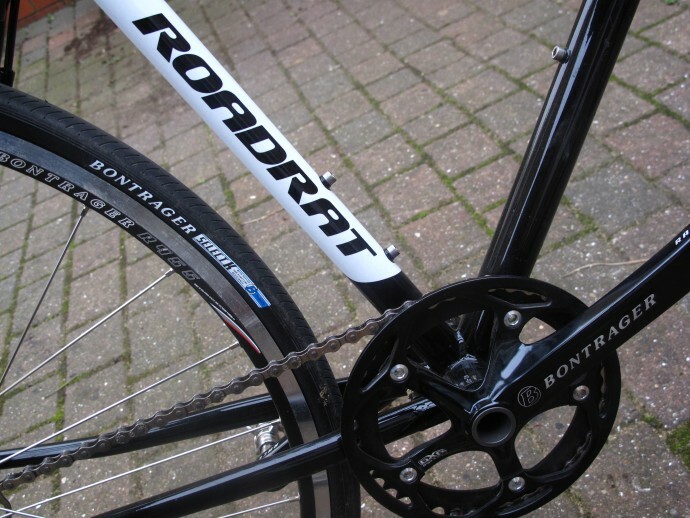 Not only is the Roadrat comfortable its adaptability is incredible too – something the drop bars can only add to. 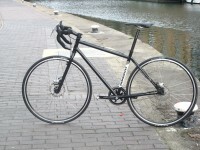 Our bike came with the Tektro cable disc upgrade which worked very well and is in keeping with its uncluttered look. The brakes bedded in quickly and didn't have an aggressive bite but were able to lock up either wheel without too much force on the brake levers. It's a shame that the forks don't have fully detachable canti mounts like there is on the back as to my mind this is a little unsightly. In keeping with its adaptable nature the Roadrat has so much tyre clearance that you can run 700 x 42c or 26 x 1.8 tires to help iron out rough ground or for further protection against punctures and you can still run mudguards! Rack mounts are fitted for those who go on epic adventures which I think this bike would be perfect for. So does the drop bar version have any advantage over the standard flat bar offering? Drops do give a wider option of positions and tend to put you in a more aggressive riding position which encourages you to push harder. I am a fan of riser bars but this bike rode well with drops and didn't feel like a mountain bike with road bars - that's got to be down to Cy at Cotic shortening the top tube. If you didn't like the hunched up riding of drop bars then swapping them for flat bars with the short top tube would give a very safe and upright riding position. Or, another 10mm on the stem to slow down the steering for more sedate/nervous riders. Or maybe you just get the flat bar version in the first place. If you like riding on drops this is the Roadrat for you, even more so if you want it as the ultimate do anything machine. If drops aren't your thing or you just want a full-on urban tool the standard issue Roadrat with riser bars is your best bet. This is possibly the ultimate do it all bike. 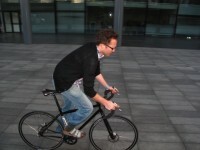 With the component package supplied, it make a nimble, low maintenance urban bike. Although it runs very well as a single speed I do feel that it isn't getting the full potential from the frame but it wouldn't take much to include gears. By swapping or adding a few components you can turn the Roadrat into a bike that is very competent at whatever it is used for, add panniers and you have something you could go touring on, put some skinny knobblies on it and race cyclo cross, it can do it all and do it well! Cotic's custom butted cromoly steel. All meticulously and thoughtfully designed in the UK. Great attention to detail and finished to a good standard. It might not be hand built but the love has most definitely been put into it on the drawing board and through testing. This bike can be adapted to suit almost any type of riding with subtle changes. Our one suits the urban rider who wants a nimble ride with minimal maintenance. The low slung compact frame is ideal for mountain bikers who want a tarmac shredder. Very clean welds throughout and all the add ons you could shake a stick at. 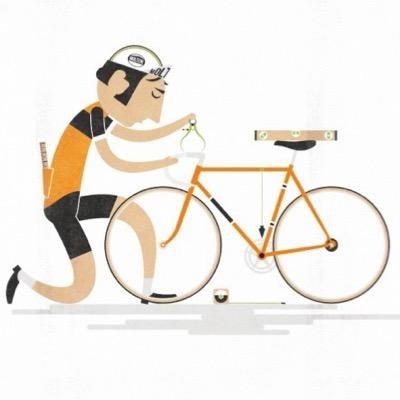 Mounts for mudguards and panniers, disc brakes or cantis. The gloss black paint had a good resistance to chipping and always looked good. £255 for frame and fork, mech hanger and UK delivery. This version of the Roadrat has a shorter top tube so you can have drop bars and still use a 90-100mm stem. The 73 degree head angle and straight legged forks makes the steering sharp and direct but not too twitchy, great for navigating through heavy traffic. The ultra compact frame has a very sloped top tube which gives you heaps of stand over height and a lot of seat post showing. The bike looks small under you and feels like you can throw it around and have fun. The thin steel tubes, 25c tyres and carbon seatpost and bars made this bike incredibly comfortable to ride, experienced even on short journeys. The springy nature the frame made it feel lively. The relatively short rear stays made the bike accelerate well. Foot overlap wasn't an issue. How would you describe the steering? Was it lively, neutral or unresponsive? The steering was lively and direct but not twitchy. The Bontrager external BB cranks transfered power well. I would like to ride this bike with gears, set up as a cyclo cross menace. Great frame with a massive universal appeal. This bike can be dressed for nearly any occasion and perform well in any of its guises. I have the flat barred version and can agree with the adaptability comments. 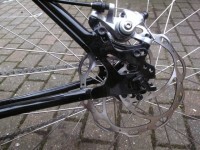 Initially set up with a 7 speed cassette and single chain ring to give a bit more flexibility. After another bike was stolen I needed more gears for winter so fitted a s/hand 105 cranks and cassette and swapped a thumbie for some XT shifters. I started doing a bit of touring and needed more gears so a triple was added. 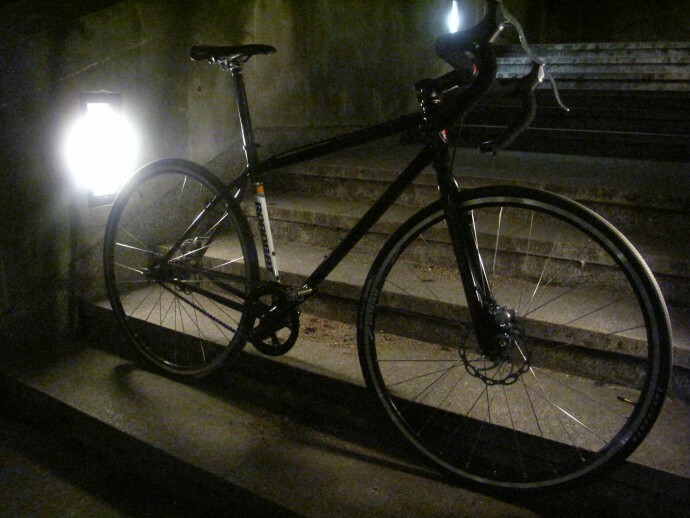 I had the drop bar version of the Roadrat which is no more. I unfortunately rear ended a car in rush hour traffic, the top tube and the down tube crumpled like tin foil and the whole thing had to be written off. I have a Surly now and though I miss the speed of the RR I definitely wouldn't buy another, or recommend one to anybody who needs to use their bike rather than just look at how pretty it is. 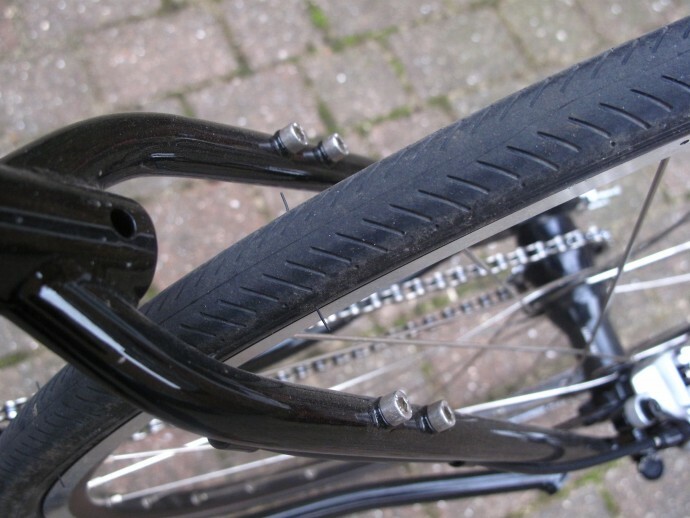 Also the spokes broke all of the time which I was told was due to cheap spokes. Not what you'd expect from a not so cheap bike! fair comment about the spokes, but just how fast did you rear end the car? Might it be that any frame would have crumpled?